Each October, American Pharmacists Month is celebrated and promotes pharmacists as medication experts, an integral member of the health care team, and directly involved in patient care. 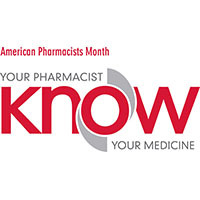 The goal of American Pharmacists Month is to educate the public, policy makers and other health care professionals about the role pharmacists play in the reduction of overall health care costs and the safe and effective management of medications. In addition to safely providing medicine, pharmacists offer lots of different services as part of their commitment to helping patients live healthier lives. From advising on allergies to diabetes to heart disease and more, pharmacists simplify care with easy access to answers that bring relief. Learn more about how pharmacists can help you.